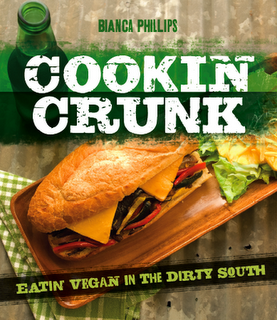 Vegan Crunk: Labor Day Weekend Eats! Paul and I grilled out Sunday night since it seemed like the thing to do on Labor Day weekend. But it was late by the time we were done — 8 pm! (I usually eat dinner around 5:30 pm) — and I was so famished that I forgot to take a picture of my plate! That almost never happens, so you know I was hangry. Anyway, we made Beyond Sausages (the best!) with grilled corn on the cob and grilled squash. Besides that, I've been eating pretty well over this long weekend. On Thursday night, I made some Purple Hull Peas from my CSA, as well as Kickin' Corn Muffins from The Engine 2 Cookbook, Steamed Kale with Mushrooms, and Corn on the Cob (with Just Mayo Chipotle mayo and TJ's bagel seasoning). I ate the leftovers throughout the weekend. As you can see, I like to eat my cornbread on top of my peas. On Sunday morning, I slept in until 8:30 am! And then I enjoyed my favorite weekend ritual — ramen, Netflix, PJs. This is the Koyo Asian Vegetable Ramen (it's baked, not fried) with air-fried tofu, kale, mushrooms, corn, and green peas. Plus, lots of TJ's Green Dragon sauce. 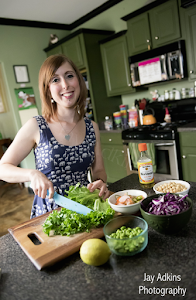 Y'all, Memphis' Trader Joe's store is opening September 14th and I AM SO EXCITED. This morning, I slept in again, but this time, until 9 am! I could really get used to these long weekends without training. Anyway, I made myself a proper Labor Day brunch of Cranberry Walnut French Toast with Maple and Banana. The bread was whole wheat cranberry walnut bread from the Church Health bakery. Church Health is a nonprofit located in our building, Crosstown Concourse, that provides healthcare for the uninsured. They had a bread sale fundraiser last week, and I picked up this loaf and froze it for later. I used Follow Your Heart VeganEgg for the egg batter to make French toast. Perfect! After brunch, I went on a little bike ride to the park since biking is about all I can do with my foot injury right now. 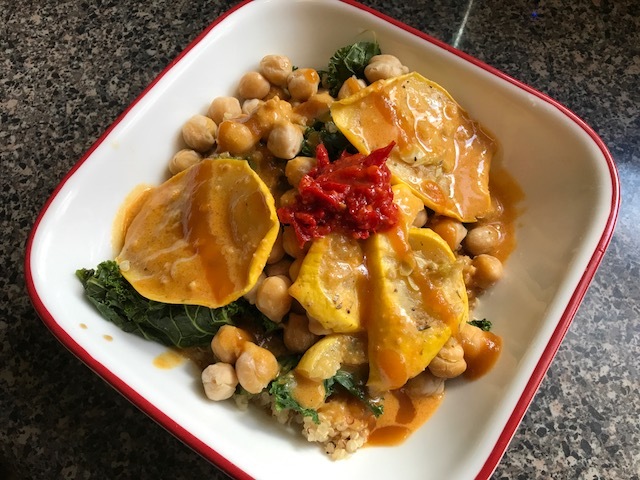 When I got back, I was hungry again, so I made a quick Chickpea, Kale, Squash & Quinoa Bowl with Thai Peanut Sauce. The kale was leftover from my dinner a few nights before. The squash was leftover from grilling out last night, and the chickpeas were from a can. The sauce was a bottled vegan Thai peanut coconut satay sauce that is delish. And the quinoa cooked up in 15 minutes. Topped with harissa and habanero sauce. This all looks great. 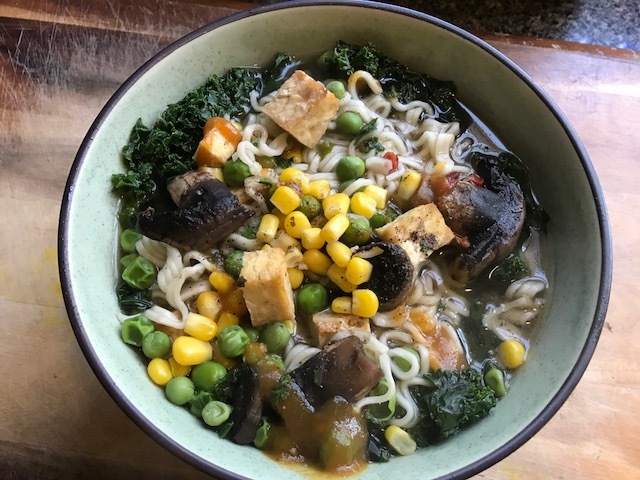 I made the ramen from the No Meat Athlete Cookbook last night, and I thought of you! Oooh yum! Everything looks delicious but I definitely have my eye on that french toast and that ramen! It looks amazing! I so need to try and make soup beans!!!! French toast is the definition of luxury breakfasting! That load you used sounds delicious too.